1. The KYZEE Wireless RGB Fan only support control light modes and speed, not including wind speed. 2. When connected with KZYEE Wireless RGB Case Fans, it must from FAN1 sequentially connected to FAN8. 3. Connect the fan to the controller with 6 Pin connector, connect the controller to the computer power supply with 4 pin connector. 【Rich Color Effects】: Each case fan is equipped with two separate light loops, having great light coverage on both front and back side. 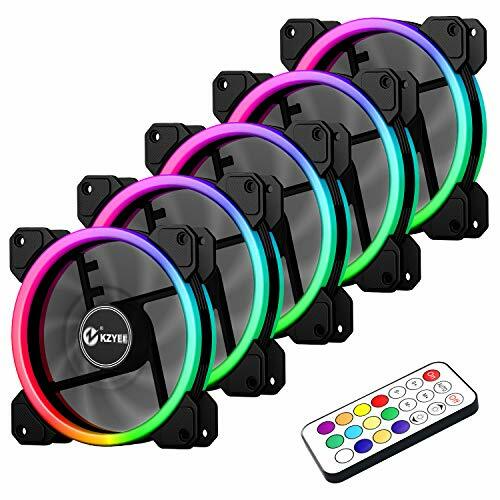 And Combined with 366 addressable LED light modes, this RGB case fan provide a variety of chooses of automated cycle play and dynamic multicolored effects to game players, creating a vibrant lighting and visual effects. 【3 in 1 Remote Control】: Built with RF Wireless Remote Controller, the case fan is easy to remote control on/off, and enables users easily to select preferred RGB lighting effects and colors(Note: Fan speed not controllable). 【Quiet Performance】: The 120mm case fans featured with nine-page silica gel fan blade, rubber pads and hydraulic bearing, which greatly prevent vibration transfer to the chassis and to ensure low noise operation. 【High-airflow Cooler】: The 6Pin interface special designed to provides RGB fan safe and reliable power output, much enough to support the Maximize airflow 1500 RPM. In addition, you shall connect the RGB cooling fans in sequence from 1 to 8. 【100% Satisfaction Guaranteed】: Top-level quality control can provide you a wonderful shopping experience on KZYEE RGB Fans. Being absolutely confidence to purchase this items, directly contact our service customers if you have any problems. If you have any questions about this product by KZYEE, contact us by completing and submitting the form below. If you are looking for a specif part number, please include it with your message.